Pluto's "heart" and other surface details are visible in this stunning false-color view of the dwarf planet, which was captured by NASA's New Horizons spacecraft on July 14, 2015. NEW YORK — NASA's New Horizons spacecraft got the first-ever up-close looks at Pluto this month, but the epic encounter very easily could have been delayed by a couple of years. Scientists and engineers had to work at breakneck speed to get New Horizons launched during a brief window in January 2006, said mission principal investigator Alan Stern, of the Southwest Research Institute in Boulder, Colorado. But the team's hard work paid off, and New Horizons zoomed past Pluto on time. "We did it," Stern said here Sunday (July 26) at the Intrepid Sea, Air and Space Museum, during a talk at the fourth annual Space and Science Festival. "We worked nights and weekends for four years." During the talk, he gave the audience some insights into the history of New Horizons, and what makes the mission special. New Horizons was one of several Pluto missions that scientists proposed and developed beginning in the 1990s, Stern said. At the time, researchers were beginning to learn that Pluto was not some lone, icy oddball, but just one of many objects orbiting in the distant Kuiper Belt, which lies beyond Neptune. That realization made the scientific case for a Pluto mission stronger, Stern said. "In the 1990s, we discovered Pluto's context — the third zone of the solar system," he said. The New Horizons team managed to keep costs down because new technologies allowed for miniaturization and more efficient data processing, Stern said. The spacecraft itself is small, weighing in at about 1,036 pounds (470 kilograms) when loaded with fuel. It had to be small in order to get as much speed as possible from the Atlas V rocket it launched on, Stern said. "We basically put up an Atlas V empty," he said. We made it to Jupiter in 13 months flat," Stern said. Records were set once again in getting to the orbits of Saturn, Uranus and Neptune. While the main purpose of the Jupiter flyby was to give New Horizons a speed boost, the encounter also provided an opportunity to check out the probe's instrument package. New Horizons caught a stunning shot of Jupiter's moon Io silhouetted against the giant planet, and the instruments were all found to be in good shape. "You can't remote-control this puppy," Stern said. 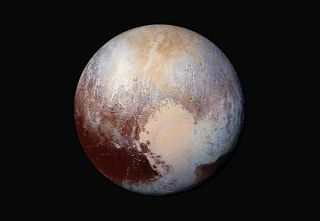 New Horizons' observations have revealed that Pluto is a geologically active world with glaciers, mountains of water ice covered with nitrogen frost and hydrocarbons such as acetylene on the surface ("Don't light a match," Stern quipped). The planet likely also has a liquid water mantle. A member of the audience asked if that might make the planet an abode for life. "Ask me in a year," Stern said. (That's how long it will take, more or less, for all of the data to come back from the probe.) "We have 15 watts [of transmission power] and 3 billion miles." The liquid water mantle is still a hypothesis, but the evidence for it comes from several directions. First, the bulk density of Pluto indicates the dwarf planet must have a certain percentage of rock given its size; the rest of its mass is made up of ice. Furthermore, at Pluto's frigid temperatures, the weight of the ice in Pluto's crust would cause the water ice underneath it — as well as any nitrogen — to liquefy. Another piece of evidence that there's water under the crust is the fact that the mountains of Pluto are made of water ice. "Nitrogen is a weak material," Stern said. "So it's pretty clear that the mountains have to be water ice. It's pretty strong, as you know from ice cubes." New Horizons will make a flyby of a second Kuiper Belt object in 2019, if NASA approves and funds a proposed extended mission. Sometime in the decade or so after that, the spacecraft's plutonium power source will run down. With all that New Horizons has discovered, and could still potentially discover in the future, one person asked what Stern's favorite part of the mission was. "Getting to Pluto," he said.